With the wide array of rope available today and continuous technological advances in line design, deciding on the best rope for each use can be baffling. 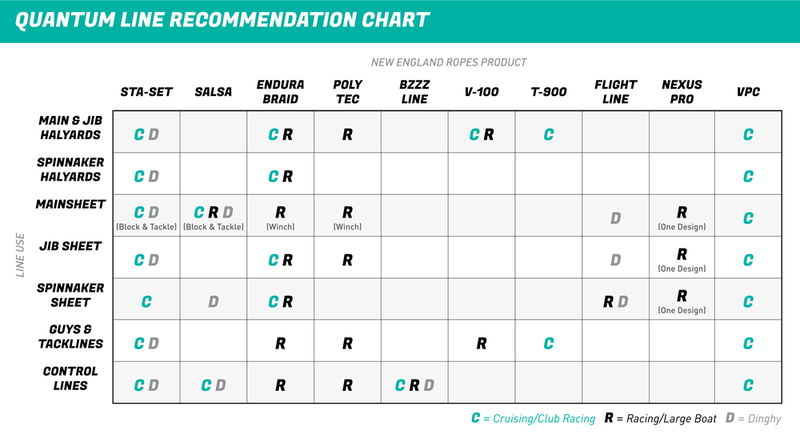 Use this guide to ensure you choose the right rope for each application. Using the proper line for each use isn’t just important for performance; it’s also important for keeping your sails safe. Break a sheet or lose a halyard while sailing, and you’ll likely find yourself breaking out your onboard sail repair kit or ending the race and heading to the loft for repairs. Our service team details what you need to know about the line options available, how they’re made, and how to choose the right one. 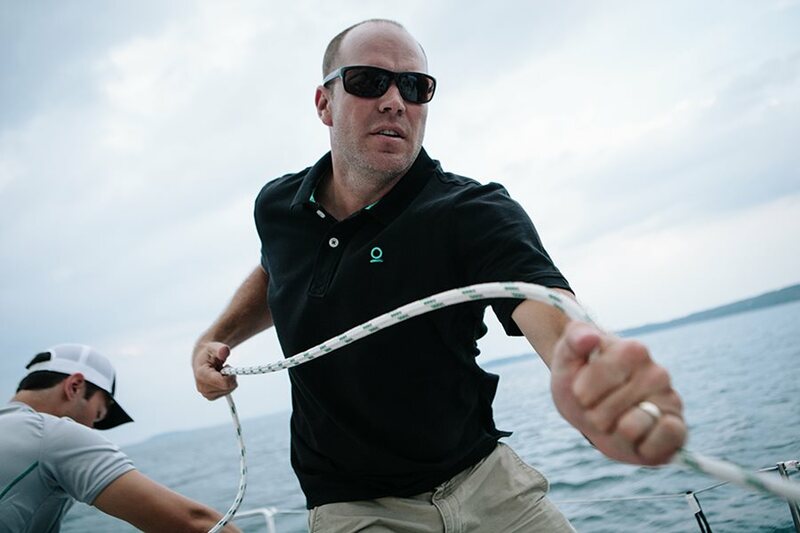 At Quantum, we’re big fans of New England Ropes. They make a great product and have an option for just about every sailor and type of sailing. All of our examples and recommendations below are from the New England Ropes collection. PROS: Polyester is a great option for applications that require strength, durability, and low stretch. PET is moderately priced, and there are lots of colors available. CONS: Polyester is low stretch, but it does stretches a lot compared to it's higher priced cousins, both initially and over time. It is heavy, and absorbs water easily. PET has poor abrasion resistance and a fairly low break strength compared to the diameter. The strength of the line relies on both the outer cover and inner core. When either of those loses strength or has an abrasion, the overall strength of the line is reduced. PROS: Aramid is a popular low stretch material with great heat resistance and strength. CONS: Aramid has a low UV resistance and does not bend around sharp edges well. PROS: Vectran® is an extremely low stretch material with a very high breaking strength, and it is the only line with zero creep. Vectran® also has high heat resistance. Overall, it is lightweight and doesn’t absorb water. The cover can be stripped for weight saving. Vectran® comes in a selection of colors. CONS: Vectran® does not have great durability or high UV resistance. Stripping the cover is not recommended and will weaken the durability of the line. Vectran® doesn’t do well with sharp corner bends, so care must be taken with small sheaves and tight turns. Vectran® also has a high price point. Endura Braid - Perfect for a competitive sailor. ©New England Ropes. PROS: Dyneema® has strong heat resistance, excellent stretch resistance, and excellent break strength. It has the lowest stretch at the break strength of all synthetic fibers. Overall, it is lightweight, and the cover can be stripped for weight-saving. Dyneema® offers color and vendor options. CONS: Dyneema® permanently creeps over time. It also has a high price point. In determining your rope priorities, start out by considering the type of sailing you’ll be doing. If you’re cruising on a budget, choose line with great durability and UV resistance. If treated well, polyester braids for all or most applications are a good option. With the high-load applications associated with larger cruising vessels, such as sheets and halyards, you’ll need line that can handle a heavier load than polyester braids can. A blended double braid Beltran® or Spectra® rope is a better option than polyester braids for these high-load applications. For club racing, ensure that the line has the proper break strength on higher load applications. Use a blended braid Vectran® or Spectra® line for the halyards, jib sheets, and guys. Avoid using polyester for these high-load applications so that you don’t have to get extra-large diameters. Polyester can be used in control lines and other lower load lines. In Grand Prix racing, just about all of the line on the boat should be stretch resistant with a strong breaking point. Spectra®- or Vectran®-based rope is a great option for this. Many high-quality constructions of Spectra® are being made. New covers are even being made out of Spectra® and Technora®, which adds greater grip around winches and reduces abrasion to practically zero. If you’re stripping the cover on some of these lines to reduce weight, only do so on spinnaker sheets, spinnaker halyards, and other control lines where the load or use is low. If a brand new high-load, low-stretch line is purchased for a given application, it’s a good idea to check the fittings it is running through. When ball bearings are missing, a winch or sheave doesn’t spin like it should. You hear odd noises, elongation occurs, and it’s probably time to replace or repair the deck fitting. If any fiberglass cracking or “spider webs” are appearing on deck fittings, it is a good idea to check the deck around the fitting and possibly reinforce the deck if any lamination issues have occurred. PRIORITIES: Very low stretch and high break strength. DESIRABLE: Light weight to reduce weight aloft. IDEAL TYPES: Spectra® or Vectran® core with a spectra chafe cover close to the shackle. With the added chafe cover at the shackle, it’s nearly impossible for the sheave to tear the halyard. PRIORITIES: A high break point is essential. Low stretch is important, but not as necessary as it is for other halyards. IDEAL TYPES: Spectra with a chafe cover near the shackle. Spectra is a low stretch rope that handles the shock loads from the spinnaker well. The cover of the rope can be removed from a portion of the halyard that doesn’t reach the winch. PRIORITIES: Dependent on system used. On a multi-purchase system, Spectra® or polyester single braids are great options. They are strong ropes and great for grip. On a winch system, low stretch and high break strength is desirable, making Spectra double braid the best option. On a block-and-tackle purchase system, some stretch in the line is okay due to low loads per each purchase. A comfortable feel on the hands is necessary. PRIORITIES: Low stretch and high break strength is essential. TOP CHOICE: Spectra core with a high-tech cover. A high-tech material resists abrasion from winches and blocks. PRIORITIES: Very lightweight rope is essential, especially for lighter air. Lines that float are a great option because they don’t add extra weight from moisture absorption. DESIRABLE: Low stretch and high break strength. IDEAL TYPES: Spectra core with a polyester cover. The cover can be removed from a portion of the line that doesn’t go through blocks and winches. This keeps the line light and reduces water absorption. IDEAL TYPE: Spectra or Vectran core with a polyester cover; add a chafe cover near the shackle. The chafe cover resists chafe and abrasion from the sprit or pole end. PRIORITIES: Depends on the application. Most control lines don’t see much use or load, so having stretchy and low break load lines is usually ok. DESIRABLE: Since most control lines are pulled manually, having a comfortable feel on the hands can be helpful. IDEAL TYPE: Spectra or polyester. Spectra can be used if wanting to remove the cover for weight reduction. Polyester is a great choice for lower load applications. When the time comes for new line, give us a call. We’d be happy to make sure your boat is set up with the right lines and ready to go.